The church is open during daylight hours on every day throughout the year. 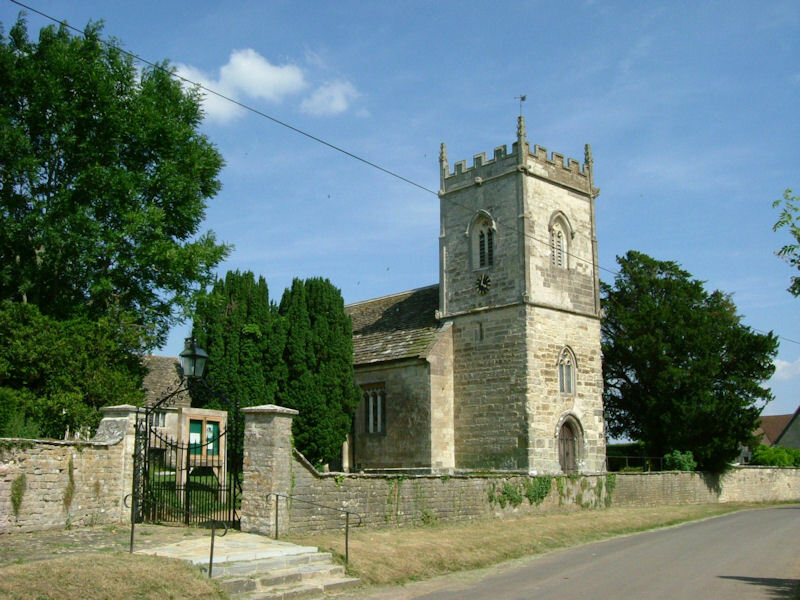 A Medieval Church was established on the site of the present Church in the 12th century. 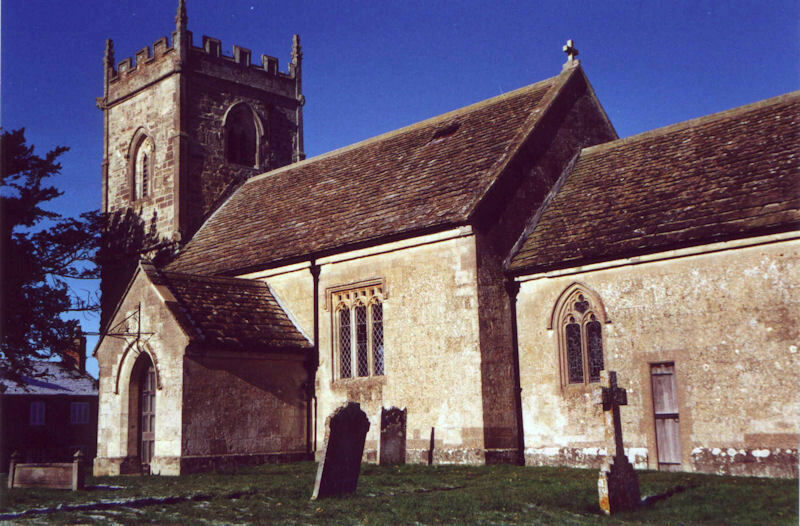 At that time Hinton St. Mary was a Lay Brothers settlement belonging to the Abbey of St. Mary in Shaftesbury. Being located alongside each other, the history of the Church and that of the Manor House are inextricably linked. The dissolution of the monasteries around 1535 marked the end of Shaftesbury Abbey. At this time, in addition to the Church, there were three main buildings and the Manor House was subsequently built on the site of a dormitory. In 1846, the Church was completely rebuilt in the Perpendicular style and this incorporated the tower constructed in the middle of the 15th century. 2 bells were hung and these are still in good working order. Parish records go back to 1581, the originals are held in the County Records Office in Dorchester and transcripts can be viewed on Ancestry.co.uk. The pulpit is 18th century and the font probably 13th century. Within the Church there are a number of interesting monuments, a particularly important one being the memorial to Thomas Freke who died in 1642. There is also a group of stained glass windows designed by Tom Denny and installed for the Millennium. 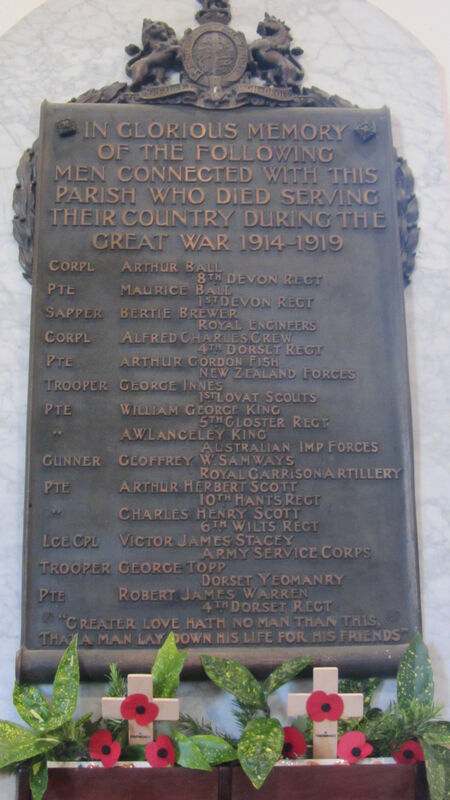 There are two war memorials in the Church. One lists fourteen men lost in the First World War and the second smaller one two who died in the Second World War. Only a little is known about the WW1 individuals. Some have family connections with Hinton St. Mary others have relatives in Sturminster Newton and a few come from other Dorset villages.. As shown below they served in many different regiments. Recently, Janet Bolton has been carrying out some research and is keen to build on the records which she has recently put together. A file containing these is now in the Church and if anyone has any relevant information please contact her on 01258-472300. Private ARTHUR WALLACE LANCELY KING. Lance Corporal VICTOR JAMES STACEY. Died 21st August, 1916. Flanders. Aged 28. Pilot Officer GEORGE ALBERT INNES. Missing from patrol over North Sea. 15th August, 1943, aged 25 years. Private LEON VICTOR JAMES WARREN.